just thought i'd take a little time to tell you what i've been planning these days - bar golf! oh yes, you read that right. 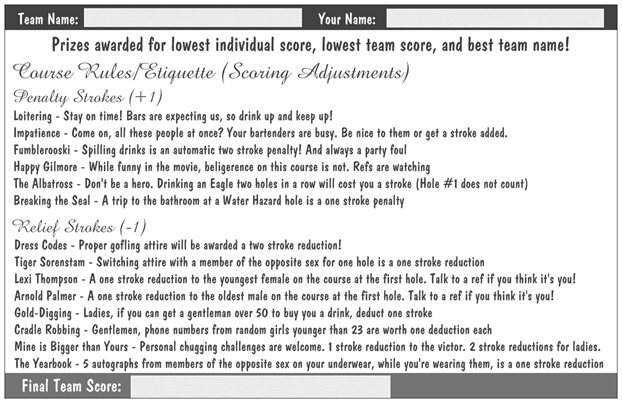 bar golf. basically it's a 9 "holes" (bars) pub crawl and the rules very vaguely resemble the rules of golf. except that you're just drinking and not actually using a club or ball. and everyone dresses in golf outfits. i love a good theme. so, to celebrate one of my best friends, Jeff, moving back to chicago, as well as two other friend's graduations, we decided to set up a round of bar golf at the river north bars here in chicago. (who have all been very accommodating and awesome) and by we i mean me. i have no qualms about claiming all the responsibility for this one! i 100% should be a party planner instead of a lawyer. i'm so much better at planning. i even made these fabulous score cards on vista print. you can get the idea of how the game works. you choose which drink you'd like at each bar. i'm actually quite impressed with myself. i may or may not have ordered a full on, made for halloween, golf costume for the occasion. looks like fun! I notice O'Callaghan's was on list...I was in Chicago for St Paddy's Day and spent a good portion of the day there! I need to plan a visit to Chicago. I absolutely love the outfit. Oh my word. I am in love with this idea. Brilliance - pure brilliance! Haha this is so awesome! Can we do this when I come visit? Blogger style haha. I've never been on a bar crawl if you can believe it! I love it! Haha totally agree that you should be a party planner.. this sounds like so much fun! 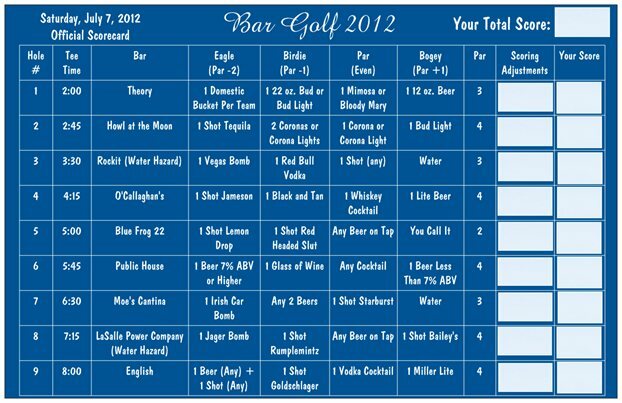 I love playing bar golf!! It is always a blast! So funn! I'll be doing a similar thing hopping around Chicago this weekend...but in a way less organized fashion. Have fun!